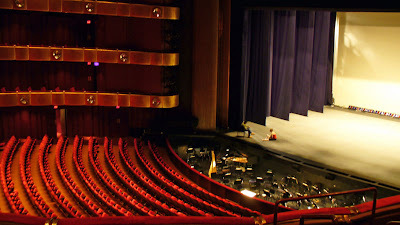 In news *not* having to do with someone's death - it seems that there are some unwanted audience members over at New York City Opera's David H. Koch Theater. That's right - commence to itching because according to the Associate Press, BEDBUGS have been discovered in a dressing room at the theater. Now, the theater is currently dark given that NYCO's fall season doesn't open for another couple of weeks. October 27th is the day that City Opera opens with Bernstein's A Quiet Place. Wait ... weren't we *just* talking about Bernstein? Spokeswoman Maggie McKeon confirmed the outbreak and according to an e-mail from the theater's managing director Mark Heiser, treatment to rid the theater of the tiny pests was under way. The bugs have been discovered in theaters, movie theaters, clothing stores, office buildings, and various apartments throughout New York City. Be gone, bugs! Those little buggers spread like a wildfire - The Wall Street Journal is now reporting that the little theater across the plaza - A.K.A. the Metropolitan Opera - has also found Bedbugs. The opera has been monitoring the auditorium, the lobby and all other public areas since August and plans to inspect all areas of the building overnight.